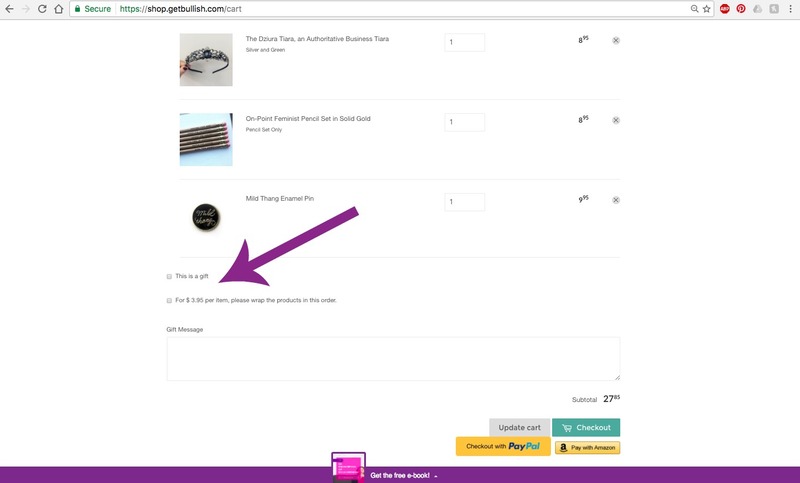 Once you get to your Shopping Cart page, you can choose to make your order a gift order. Check the box that says "This is a gift", and we will not include an invoice. Instead, the gift recipient will get a gift slip with the gift message (if any), no prices, and with the name of the sender (you!) There is no charge for this. If you want to include a gift message (also at no charge to you), type your message in the Gift Message box, and it will be printed on the included gift slip. If you select "For $ 3.95 per item, please wrap the products in this order," your order total will be updated and we will wrap your items before we send them. If you have questions or special handling instructions, email help@getbullish.com as soon as possible after you place your order.